Come down to 241 Bourbon Street, and you’ll find the best of the Wild, Wild West right here in The Big Easy. The Bourbon Cowboy is a true Honky-Tonk Saloon where the DJ’s spin the best mix of Country and Rock music from the drivers seat of a classic fire-engine-red 1950’s era Chevrolet Pickup Truck. The One-n-only Bourbon Cowboy is the place to go for the best Bull Ridin’, Bead Tossin’ and Boot Scootin’ on Bourbon Street, or in the whole wide world. So kick up your heels and set a spell, dance to you favorite song or take a spin on our famous Mechanical Bull Ride. Now Belly up and drink it up, with 3-4-1 happy hour and $3 tooters you’ll never have an empty cup! Rise above the crowd for a bird’s-eye view of Bourbon Street? Head on upstairs to our huge wrap around balcony overlooking Bourbon and Bienville. Live, local New Orleans music shows during dinner and fun late night Brass Bands and touring acts that play late into the night! Established in 2009. 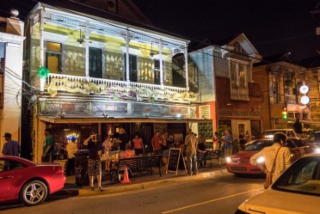 The Maison is located in a historic 19th-century building on Frenchmen Street in the Arts and Cultural district of New Orleans known as the Faubourg Marigny. 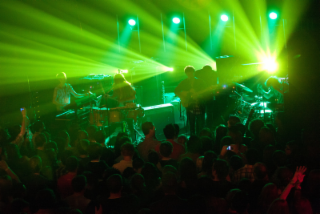 The building first became a venue known as "The Faubourg Center" in the 1990's. Following the closing of The Faubourg Center, the space later became Ray's Boom Boom Room, a nightclub and live music venue on the developing Frenchmen Street nightlife strip. Following Hurricane Katrina, the venue came under new management and was dubbed La Maison de la Musique, where it continued to serve as a live music and nightlife spot on up-and-coming Frenchmen Street. The Maison came under it's newest ownership and took on it's current name Halloween of 2009. It has since grown to be the go-to venue for jazz, brass and funk shows seven nights a week! For the more quintessential New Orleans experience, stroll off Bourbon Street through our historic carriage way to our lush inviting courtyard. Enjoy the sounds of the music that made New Orleans famous sitting at a wrought-iron table sipping the best new cocktail to hit Bourbon Street in a generation. The Heat, Bourbon Heat’s signature cocktail made with a blend of Malibu Red Rum and fruit juices has become a favorite of all who visit Bourbon Heat. If what you prefer is the traditional feel of a French Quarter local’s hangout, the Courtyard bar is the place for you. It’s rustic brick and stucco walls, ornate carved wooden back bar and flagstone floor and wooden bar stools can’t be mistaken for anything but a French Quarter low key bar where you can spend hours talking to the bartender. The opposite of the low key Courtyard Bar is the upstairs dance club. 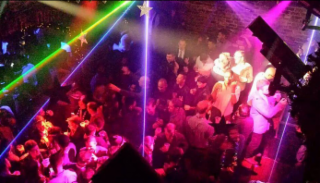 The club features, a high-tech light and laser show, VIP Bottle Service and the best DJs and Video DJs in the City. 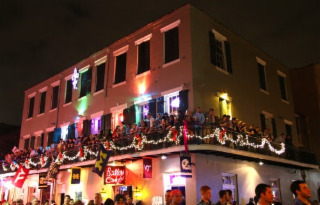 When the action gets too hot visitors can step outside to the 50ft balcony overlooking Bourbon Street. Bourbon Heat is available for private functions from small social or corporate events to complete buyouts. Established Spring of 2000, d.b.a. 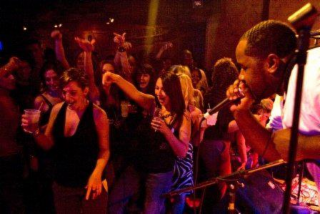 is a live music club that features local & regional acts nightly. Located at 618 Frenchmen Street in the historic Faubourg Marigny, we offer a vast selection of beer, wine & spirits in a comfortable, smoke-free setting. We were one of the first music venues in New Orleans to choose to become smoke-free in an attempt to create a healthier environment for our guests, staff & musicians. We also recycle our glass & cardboard at our expense, in keeping with our mission to be conscientious members of the New Orleans community. For more information & customer feedback, check us out on Yelp, follow us on Twitter & friend us on Facebook. We do not take reservations or do advanced ticketing. For all shows, it is first come, first serve by paying the cover charge at the door. 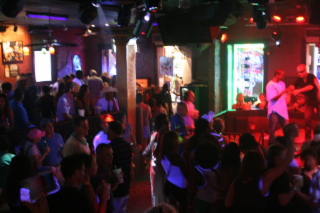 Razzoo is the #1 Place to Party on Bourbon Street! 3 for 1 Happy Hour is every day, from open until the band comes on around 8pm. Triple shot cocktails, 3 beers for the price of 1, and $3 tooter shots of anything you want. The Bacardi Hurricane, New Orleans’ most popular drink, is ALWAYS 3 for 1. Our Hours of operation are as follows: Mon-Wed 2:00pm-til, Thurs-Sun 12:00pm- til. For special events we will open early, time depending upon event. Need a break from the high energy entertainment and loud music? Want to relax with friends and enjoy a few cocktails? Check out our incredible courtyard. With ample seating, a large bar and a flaming fountain, Razzoo’s world famous courtyard is always a memorable experience. It’s a must see for locals and tourists alike. Our friendly staff is always willing to take your picture in front of the flaming fountain. Trying to watch the big game? No problem. 5 LCD televisions surround the courtyard for your viewing pleasure. Baseball, football, soccer, hockey, basketball or poker: it’s always sports. Ask a server for any game you want, and if it’s televised, we will show it. Oz New Orleans opened in 1993 and quickly earned its place as the premier gay dance club in New Orleans. We strive to reinvest in our community through various charitable events, donations, Partnerships, and we produce nationally recognized community events like the annual Bourbon Street Awards held each Mardi Gras. Locally we are proud that our hard work and effort is recognized every year when we are awarded such honors as "Best Gay Bar"- Gambit's Best of New Orleans survey and "Best Dance Club"- Times Picayune Reader's Choice survey. Within the GLBT community, Oz New Orleans was recognized this year by the Gay Appreciation Association (GAA) as Dance Club of the Year and Show Bar of the Year. Members of our staff were award recipients this year winning such honors as: The Marsha Delain Award of Excellence, The Sonny Cheridon Comedy Award, DJ of the Year, and finally our General Manager Tom Elias was awarded the honor of Man of the Year. The Willow is a premier nightlife and concert venue located less than one mile from three major universities in Uptown New Orleans. 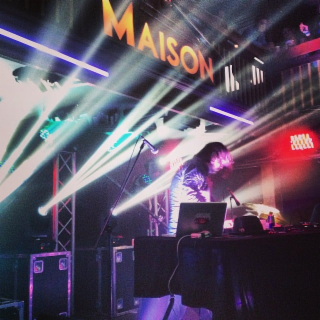 Its unique fusion of live music and DJs provides event goers with the opportunity to experience their favorite artists amongst the lights and sounds found typically in downtown venues. 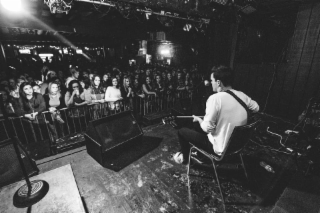 One Eyed Jacks is the premiere venue in the French Quarter for touring alternative acts. We offer backstage room, 400 person capacity concert room, full-sized stage and P.A., In-House Engineers, local promotion, and a vibe no other venue can match. Republic NOLA caters to a diverse, interesting, and eclectic audience who enjoy music, cocktails, and entertainment of all kinds. Our guests’ experiences are paramount to everything that we produce. We aim to be stylish, elegant, sophisticated, and artistically credible, yet approachable. We will constantly innovate, while maintaining the history and classic beauty of our space. 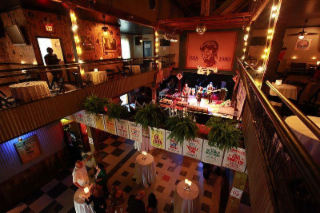 THE SPACE Republic NOLA can accommodate any event from 10 to 1000 guests by using one or more of our historic spaces. Main Room (Downstairs) 4500 sq ft featuring cocktail, lounge and high-top seating. Able to comfortably accommodate up to 700 people. Ideal for any live performance or presentation, Republic houses a stage, state of the art light and sound production, and a projector with a large screen. Mezzanine (Upstairs) 2500 sq ft terrace overlooking the main floor and stage. Able to comfortably accommodate up to 200 people. The mezzanine showcases some of the most classic features of the building: the art deco murals, vintage brick walls, large slate bar, crystal chandeliers, and exposed wooden beams. With a full bar and both cocktail and lounge seating, this area can accommodate a full fledged party or be arranged intimately enough for a private dinner. The Maple Leaf showcases local music and culture. We are the longest continuously-operating music club in New Orleans. We are also the starting off point for the Krewe of O.A.K. Midsummer Mardi Gras Parade, every August. A hangout for musicians, host to poetry readings, second lines, weddings and wakes, the Maple Leaf is a must see on any visit to New Orleans. 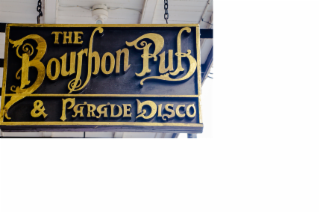 The Bourbon Pub and Parade is New Orlean's largest gay bar and dance club. Daily happy hour specials as well as entertainment and dancing in the Parade. The Pub is a video bar and is open 24/7! 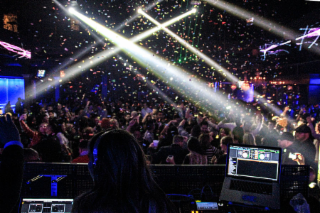 Every Saturday Night the two story warehouse turns into Metropolitan night club and opens its doors as the premier video night club of New Orleans. Two rooms filled with smoke machines, intelligent lighting and strobes set the party atmosphere. Two different formats are offered to our customers. Top 40, Hip Hop, Mash Ups, Rock and Pop are played in one room. The second room plays the best in House, Electro, Techno, Dubstep and Breaks. Some amenities offered are valet parking, covered walk ways, 11 bartender stations, coat check on select nights and VIP table service. The Metropolitan’s VIP Experience is designed to offer our customers impeccable bottle service at affordable prices. The Metropolitan has 14 beautiful VIP sections capable of accommodating parties of all sizes. Music clubs are rarely dedicated to a single musician, and few as influential as performer, composer, and pianist Professor Longhair. Henry Roeland Byrd, (a.k.a. Professor Longhair) is one of the most revered rhythm and blues musicians in the legacy of New Orleans music. Longhair created a unique style by fusing rhumba rhythms with boogie-woogie, blues and southern R&B. Fess composed many songs which are part of the Crescent City lexicon, like "Mardi Gras in New Orleans," which serves as the soundtrack to Carnival every year. Longhair influenced his musical peers and progeny in the Crescent City since the 1950s including Dr. John, the Meters, the Neville Brothers, Allen Toussaint, and many others. Tipitina's began as a neighborhood juke joint, established in 1977, by a group of young music fans (The Fabulous Fo'teen) to provide a place for Professor Longhair to perform in his final years. The venue, named for one of Longhair's most enigmatic recordings "Tipitina," has survived in an ever-changing musical climate despite changing ownership and briefly closing in 1984. Many of the Crescent City's most beloved artists developed and continue to grace the stage at Tipitina's including Dr. John, the Neville Brothers, the Meters, Cowboy Mouth, the Radiators, Galactic, Better Than Ezra, and Troy "Trombone Shorty" Andrews. Tipitina's has been fortunate over its history to host national artists including Wilco, Nine Inch Nails, Pearl Jam, Lenny Kravitz, Bonnie Raitt, James Brown, Widespread Panic, Stevie Ray Vaughan, Tim McGraw, Goo Goo Dolls, Parliament Funkadelic, Robert Cray, Patti Smith, Willie Nelson, Buddy Guy, Dresden Dolls, and Medeski, Martin & Wood. Many historic live recordings were made at Tipitina's by artists including Professor Longhair, Tuts Washington, Dr. John, the Neville Brothers, Anders Osborne, Kermit Ruffins, Galactic, Kim Carson, Wet Willie and Flow Tribe. As a timeless musical institution, Tipitina's has promoted unforgettable music over its rich history and will continue to well into the future. "THE PREMIER LIVE MUSIC VENUE IN THE CITY" Where Y'at Magazine The Blue Nile is New Orleans' premiere intimate music venue. Located in the heart of the historic Frenchmen Street, it has been the home of countless top funk, blues, soul, and brass shows, featuring local, national and international acts. 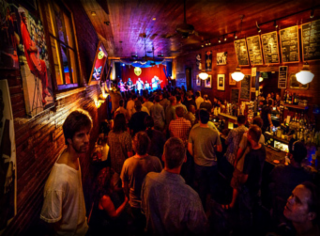 This venue is well known as the original music club that gave birth to the music culture on Frenchmen Street. VENUE TIMINGS: Please check the event calendar. Normally open 1 hour before the Show!